The AR15 upper receiver (often simply referred to as an “upper”) holds and protects many of the most important components on your AR15. 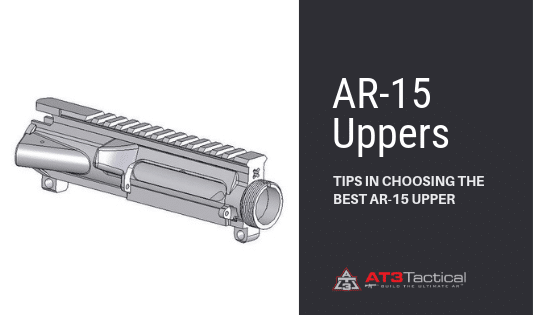 There are many types of uppers on the market, and it’s vital to understand the differences between uppers when building or buying an AR15. Your receiver will be either “flat top” or “carry handle” – flat top has a picatinny rail on the top of the upper, while carry handle uppers feature a fixed “carry handle” on the top of the upper. (Note: the carry handle is actually a rear sight assembly, so you probably shouldn’t use it to carry your weapon). You’ll often hear of receivers as being A1, A2, A3, or A4 receivers. We have a great article that explains this in detail, but generally the big difference is flat top vs carry handle. The other big consideration is the forward assist button. Some uppers have them, some don’t. It’s debatable whether this button is really necessary for civilian use, but just remember all military M16 and M4 rifles have them for a reason – a tap on the forward assist will assure that the bolt is fully seated. So which upper is right for you? We recommend a flat top upper with a forward assist for most setups – the picatinny rail provides versatility, and it’s the most popular style of upper, which means that it’s cheap and plentiful. Upper receivers can be made from various metals, but aluminum is by far the most common material. Beyond the material being used, the construction of the upper is determined by the manufacturing methods used. Forged metal uppers provide the ideal grain structure or orientation that produces the best mix of mechanical properties like hardness, fatigue limit, specific weight and others but they are denser and heavier. A forged upper is created by “forging” (hammering) the upper into the proper shape and then typically it’s finished up with a CNC lathe. The billet receiver is made by milling a solid hunk of metal with a CNC, until it’s the proper shape. Billet metal has similar mechanical properties to forged, but they are less dense and lighter at the expense of a little strength in the material. Cast metal is the lightweight of the group, but it also offers the least amount of strength. But since it’s usually the lightest upper, sometimes cast is “good enough”. Cast uppers are made by pouring melted metal into a form (also known as “die casting”). Typically some finish work is then done with a CNC. A stripped upper consists of only the upper receiver itself – it’s basically just the main a solid piece of metal. A completed upper will come with the ejection port door and the forward assist button installed. You will also see “complete upper assemblies”, which include the complete upper along with the charging handle, barrel, handguard, and possibly the bolt carrier group. So basically, the stripped lower is a single part – the upper receiver. A “complete upper” will include a few more parts. And a complete upper assembly is a full upper-half of an AR15 rifle – just attach to a lower receiver and it’s ready to fire. Need suggestions for an inexpensive beginner optic for a Bushmaster M4 A2 Patrolman.